Geos Neighborhood Naturally Powered. People Connected. Geos is walkable and bikeable, with beautiful and interesting pathways, places, and things to do. A network of quiet paths and tree lined streets lead through common greens, past community gardens, and the town squares, and onward to the wild areas along the Ralston Creek regional greenway, and further to schools, recreation centers, and Westwoods Golf Course. The Neighborhood Greens: At Geos, many homes face onto common greens ringed with fruit trees, creating mini orchards of apples, pears, plums, and cherries. 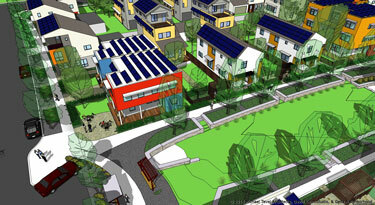 They are extensions of the home, offering outdoor places for community gardening and neighborhood get-togethers. And the greens provide safe and fun places for kids to play just outside the front porch. The Neighborhood Squares: Three town squares anchor a community park system, and provide settings for events such as receptions, weddings, outdoor films, concerts, and farmers markets. Community gardens and orchards are threaded throughout. As a whole, Geos is an interesting and complete place to enjoy without ever stepping into your car. © 2019 Geos Neighborhood. All Rights Reserved.